I read a book not too long ago that proclaimed that when people have a plan in place and practice that plan, when disaster strikes they are much more likely to prevail than people that don’t have a plan. This is one of the reasons that it’s mandatory that schools and other public facilities conduct fire drills. With fire drills at least once a quarter the children (and adults) will know what to do in case of a real fire. I was married to a firefighter for 25 years and we had ladders and ropes in the second-floor bedrooms of the house, and even in my new home, I have ropes in the bedrooms in case they are ever needed. Have you thought about how you would get out of your home, your workplace, a nightclub or a church if there is trouble? In the same vein, we need to have an exit plan in case there is trouble in the homeland. Do you know what to do if we have a total loss of power? Have you told your family members the meeting place if everyone is scattered all over town? Have you discussed with them what to do if it’s not possible to leave where they are? Just because you don’t want it to happen doesn’t mean it won’t. Not talking about it is a sure way to create chaos and confusion instead of cool heads and confidence. One of the things that I have learned from my wealthy friends and mentors is that a good exit strategy includes having access to other countries. I’ve been taught that one should have “flags” in other places so that flexibility is always the rule of the day. For example, if the banking system goes down in the States, smart people have access to assets abroad. A good exit strategy also includes having residency and lodging in other countries, which my wealthy friends and mentors have. I am following in their footsteps to make sure that WHEN the excrement hits the portable cooling device in the States I will have a place to go that has food, water, shelter, and assets to build again. What’s your exit strategy? 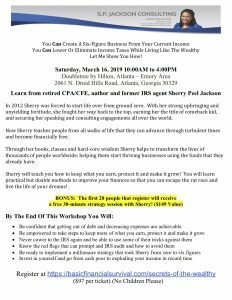 If you want to learn more about how to create a viable exit strategy for yourself and your family then join me in Atlanta on March 16th and exit strategies will be one of the things that we discuss. You, my loyal subscribers, will get first dibs on the special that I offer. The first twenty (20) people to register for the seminar will receive a complimentary 30-minute strategy session before or after the seminar.